ASTANA. KAZINFORM Central Asia Renewable Energy Summit 2019, initiated by PEAK Events and Renewable Energy Association of Kazakhstan, took place in Astana. ASTANA. KAZINFORM The Best Available Technologies Inventory being built in the country will allow choosing the optimum alternatives of solutions, speeding up the process of selecting and taking decisions during realization of green projects, Kazinform reports. ASTANA. KAZINFORM - NC "Astana EXPO-2017" JSC participated in the Investor's Day held by the Shanghai Stock Exchange, Kazinform has learnt from the company's press service. DUBAI. KAZINFORM Expo 2020 Dubai has teamed up with worldwide technology company Cisco to provide cutting-edge digital connectivity that will ensure that Expo's millions of visitors have the richest and most tailored experience possible, WAM reports. ASTANA. KAZINFORM Kazakhstan will have one of the largest pavilions at Dubai EXPO 2020, next to the UAE, Monaco, Switzerland, and Luxembourg, Kazinform reports. ASTANA. KAZINFORM - Kazakhstan signed on to participate in the upcoming Expo 2020 Dubai, Kazinform has learnt from the press service of NC Astana EXPO-2017 JSC. ASTANA. KAZINFORM - Astana EXPO-2017 National Company, Akmola Regional Administration, and Atameken National Chamber of Entrepreneurs signed a tripartite Memorandum of Cooperation, Kazinform reports. ASTANA. KAZINFORM - Within the framework of the official visit to Kazakhstan, the parliamentarians of the Republic of Korea led by Speaker of the National Assembly of the country Chung Sye-kyun visited Nur Alem Future Energy Museum, the PR Department of Astana EXPO-2017 National Company reports. ASTANA. KAZINFORM Yerbol Shormanov, the CEO of Astana EXPO-2017, has held today a meeting with Ambassador Extraordinary and Plenipotentiary of Japan to the Republic of Kazakhstan Ichiro Kawabata, the press service of the national company says. ASTANA. KAZINFORM President of Kazakhstan Nursultan Nazarbayev received a congratulatory letter from Secretary-General of the Bureau International des Expositions Vicente González Loscertales who admires the tremendous success of the Astana Expo 2017 International Specialized Exhibition themed "Future Energy". ASTANA. KAZINFORM Secretary-General of the Bureau International des Expositions Vicente González Loscertales congratulated President Nazarbayev on the successful holding of the Astana EXPO-2017, Kazakhstanskaya Pravda newspaper reports. ASTANA. KAZINFORM On behalf of President Nazarbayev, Chairman of Astana EXPO-2017 Akhmetzhan Yessimov awarded Vicente Loscertales the Dostyk Order of the 2nd degree, the company's press service reports. ASTANA. KAZINFORM - The New Year's Tree will be installed at EXPO site this year, Daulet Yerkimbayev, Director of Commercialization Department of "NC "Astana EXPO-2017" JSC, said at a press conference on Tuesday. ASTANA. KAZINFORM - King Abdullah II of Jordan has paid a visit to the Nur Alem Museum of Future in Astana today. It was the first visit of a foreign leader to the pavilion after the EXPO-2017 had wrapped up in the Kazakh capital in September. ASTANA. 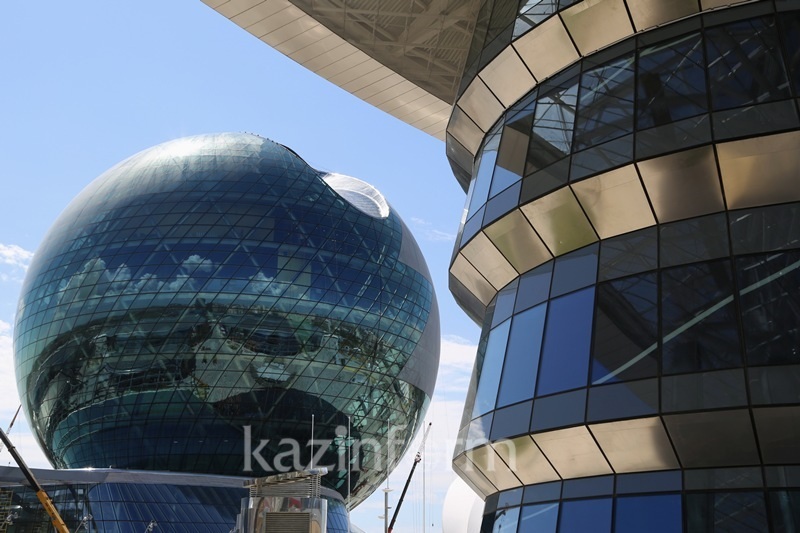 KAZINFORM - The most popular spot during the EXPO-2017 in Astana - the Nur Alem pavilion will reopen its doors on November 11, Director of PR Department of "NC "Astana EXPO-2017" Sergey Kuyanov said Wednesday. ASTANA-ATYRAU. KAZINFORM - Atyrau region is presently implementing five EXPO projects worth over 140 billion tenge, akim (governor) of the region Nurlan Nogayev announced at the press briefing on Friday. ABU DHABI. KAZINFORM - The National Media Council, NMC, has organised a special ceremony in Abu Dhabi honouring the strategic partners and volunteers who participated at the UAE Pavilion at Astana EXPO 2017. ASTANA. KAZINFORM - Lithuania summed up results of its participation in the International specialized exhibition EXPO-2017 in Vilnius, Kazinform has learnt from the Kazakh MFA's press service. ASTANA. KAZINFORM The Ministry of Energy of the Republic of Kazakhstan is now considering over 130 projects presented at the Astana Expo 2017 for implementation in Kazakhstan, Director of the Ministry's Renewable Energy Sources Department Ainur Sospanova told a Government briefing, Kazinform correspondent reports.